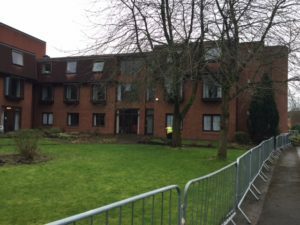 St Joseph’s Care Home Public Consultation – NOW CLOSED. Thank you for taking the time to review the plans for the proposed changes to St Joseph’s Care Home, Manchester. 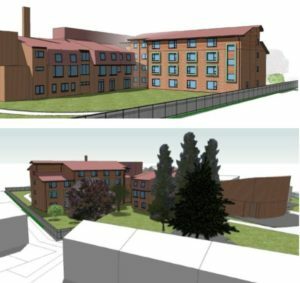 Brooke Smith Planning (Arcadis) have been appointed by The Little Sisters of the Poor to pursue the preparation of a planning application for demolition of the existing north western wing, and erection of a replacement wing, to provide improved living accommodation for existing residents of the home. As a result of the ongoing refurbishment works to the existing building, the number of bedrooms within the home has been significantly reduced from 53 care bedrooms and 2 independent living units, to 39 care rooms and 2 independent living units. 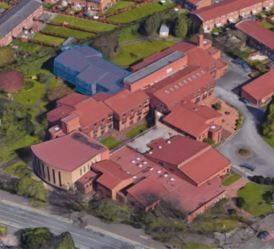 The current proposals seek to address that deficit by reconstructing the northern wing, ensuring the site is utilised in the most appropriate way. The existing wing projects within the northern extent of the site, and currently rises to three storeys in height. This area of the site provides an ideal opportunity to develop a high quality replacement wing, which will provide much needed modernised living accommodation for the existing residents of St Joseph’s Care Home. The proposed development will incorporate a total of 18 en suite care rooms, spread over ground and first floor levels; and, 10 independent living units spread over the second and third floors. Each floor will also be served by a communal lounge, an assisted bathroom and office space/housekeeping store. The existing grounds surrounding the building will also be landscaped to introduce planting and walkways which will be specially designed for elderly people suffering with dementia. The momentum of the proposed development seeks to respond to recent and ongoing changes within the care sector. Operational requirements associated with modern day care accommodation now requires additional space within individual rooms, for care givers to operate various types of equipment, including mechanical hoists. This current proposal forms part of the ongoing phased refurbishment programme to upgrade the existing care accommodation at St Joseph’s. The refurbishment works which are currently being implemented involve internal reconfiguration to create larger bedrooms, with new en-suite facilities, allowing for wheelchair and hoist access. An informal public drop in session is being held at St Joseph’s Care Home on Tuesday 24th April, from 2pm until 4pm. Anyone who is interested in hearing more about the proposals is welcome to attend and speak with one of our team. The application is being prepared and is expected to be submitted to Manchester City Council during May 2018. Once the application is made the City Council will then directly consult with local residents again to obtain your views.